A constant voltage constant current (CVCS) regulator doesn’t mean a system with a constant load, since there will be no regulation in such case. What we call CVCS regulator is a regulator with two modes. The first mode is constant voltage, where the regulator trying to regulate the supply to a variable load at a constant voltage. In this mode off course the current will be variable depending on the load. The current will vary a a range that is limited to a predetermined maximum current level. 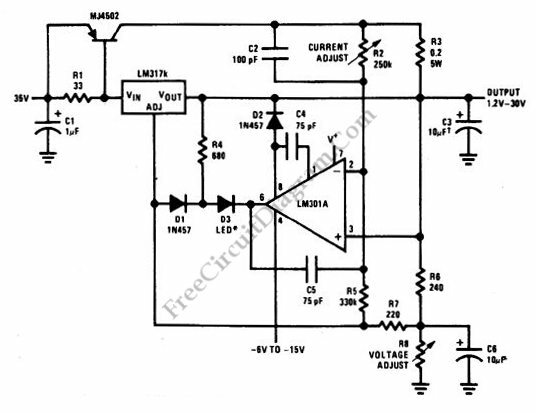 When the load draw more current than this level then the regulator will switch to constant current mode, where the regulator keep the current at a fixed maximum value. Any attempt of the load to draw more current will cause the regulator to decrease the voltage as a reaction to keep it constant, so it acts like a current limiter. Here is the schematic diagram of the CVCS regulator. The output current limit is set by R2 variable resistor (trimmer potentiometer) and the output voltage is adjusted by R8 variable resistor (trimmer potentiometer). The most popular application of this type of regulator is battery charger. It is the simplest battery charger which has the best trade-off between the charging time and the safety, and it works for almost any type of battery. When the battery is empty the maximum current will be limited (constant current) but when the battery is near full then the voltage will be limited (constant voltage). The current limit is adjusted at 50% capacity of the battery, for example for 12V 5AH lead acid battery, the current is limited at 2.5A and the voltage is set to 13.1 V. If the circuit charge the battery at constant current then the battery will be fully charged at about 2 hours, but the actual time will be longer since the charging current will gradually be decreased when the battery voltage is getting closer to the full-state voltage, gradually change from constant current to constant voltage mode. This method is considered as a slow charging because it applies the voltage only at its maximum trickle charging voltage rating (13.1V for lead acid battery) for simplicity, while faster charging method will have complex stages from warming up, fast mode, and trickle mode.